It is always a good idea to print designs out true to size to use as templates in deciding which one works best with your pattern. It’s also good to make a full front bodice pattern with something that you can see through, like interfacing or the Swedish tracing paper (See Photo 1). 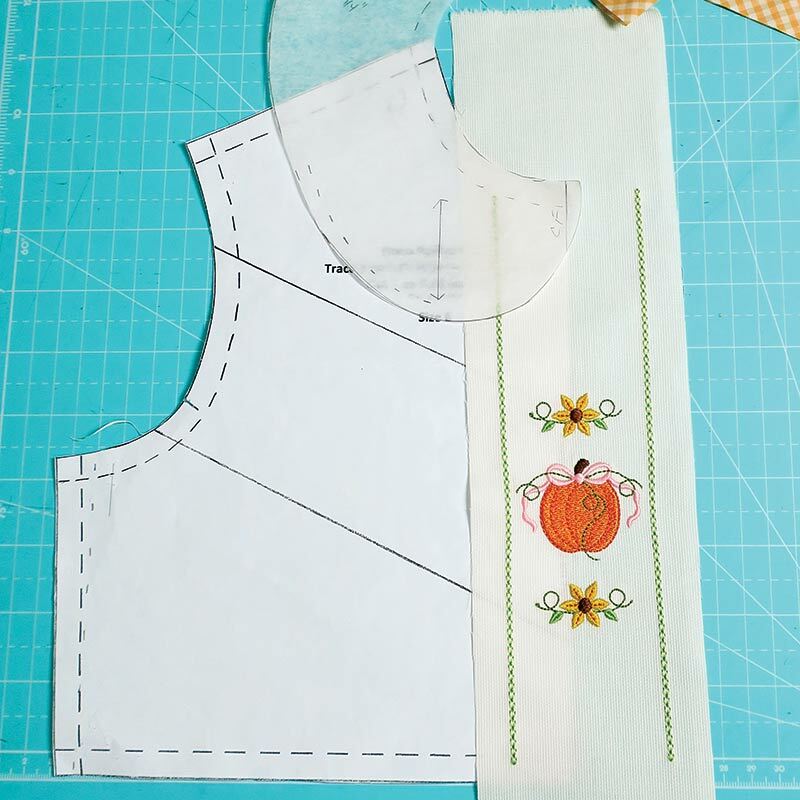 When laying the pattern onto the design, decide where you want it on the bodice. For a vertical placement, I tend to like mine closer to the waist-line, but you may prefer yours to be more to the neckline. The choice is yours. 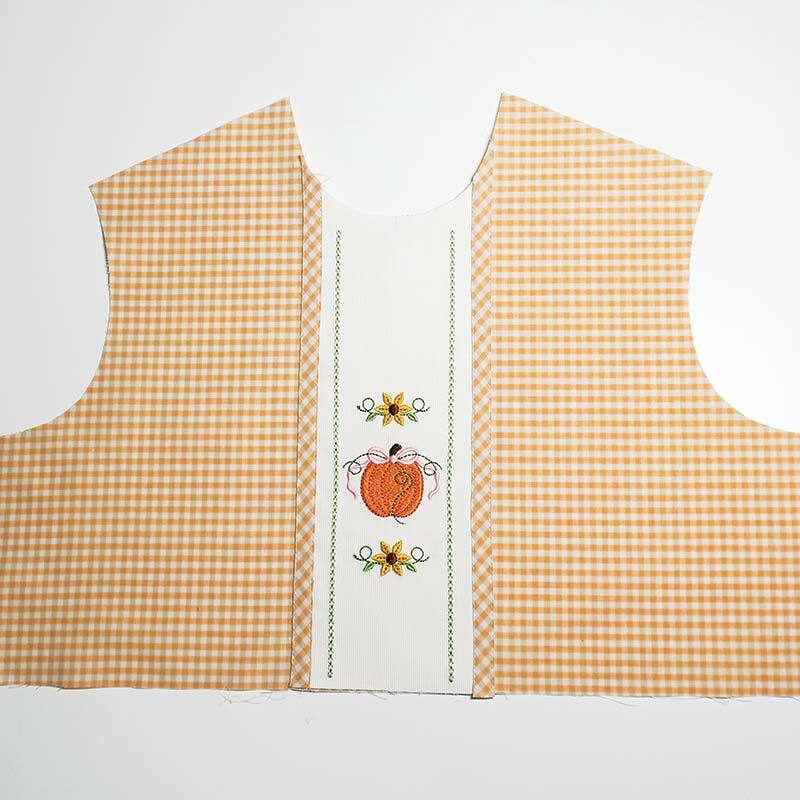 If you are going to add a collar to the garment, be sure to lay the collar pattern, minus outer seam allowances, onto the bodice so you can make sure the collar is not going to cover up the embroidery design (Photos 1 and 2). For the girl’s dress, I used Gail Doane’s Pintuck bodice dress pattern from the Premiere issue of Classic Sewing, but any bodice pattern can be used. While I made mine with an inset look (Photo 3), the design can certainly be stitched onto the fashion fabric. I used one layer of Floriani Stitch N Wash, hooped with a fabric block of cotton piqué, and I floated one layer of Sulky’s Tear Easy on the bed of the machine, under the hoop. I needed something that would tear away easily and not put a pull on the outline vines, and Sulky Tear Easy is great. I chose the Florani Stitch N Wash because I did want some of the stabilizer fibers to remain under the pumpkin and flowers, while the rest washed away. When the design was complete, I “melted” the Stitch N Wash away with water and lined the inset with Baby interfacing. I needed a little more coverage for the plaid not to show through, so I lined the bodice with Imperial Batiste. 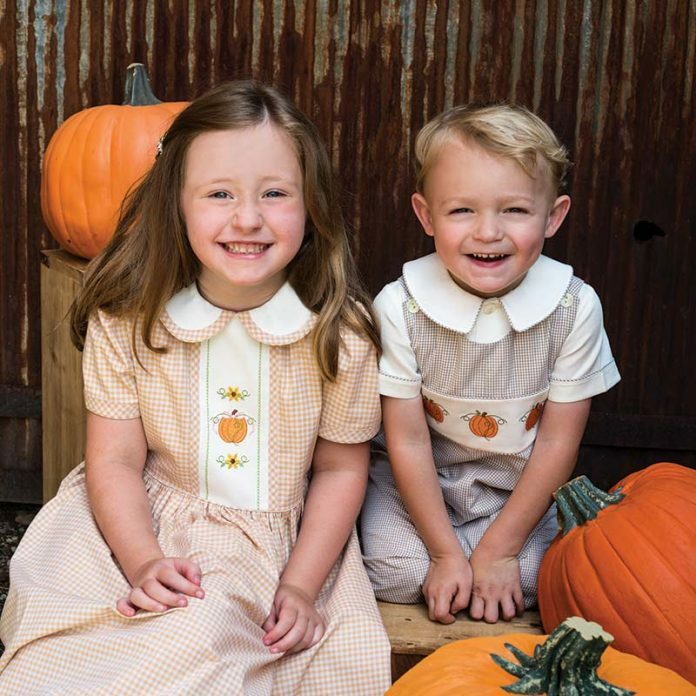 For the boy’s outfit, I used Johnny from Children’s Corner made from khaki and cream gingham check with an inset of cream piqué. The piqué shirt with coordinating piping on the collar and cuffs was the ideal addition to the button-on-the-shoulder style long-all. 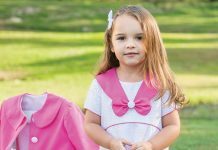 Joy Welsh started her own line of appliquéd children’s clothing at a local children’s shop. 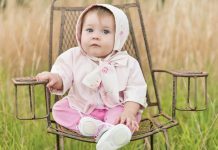 The shop owner asked her to start a line of heirloom clothing. 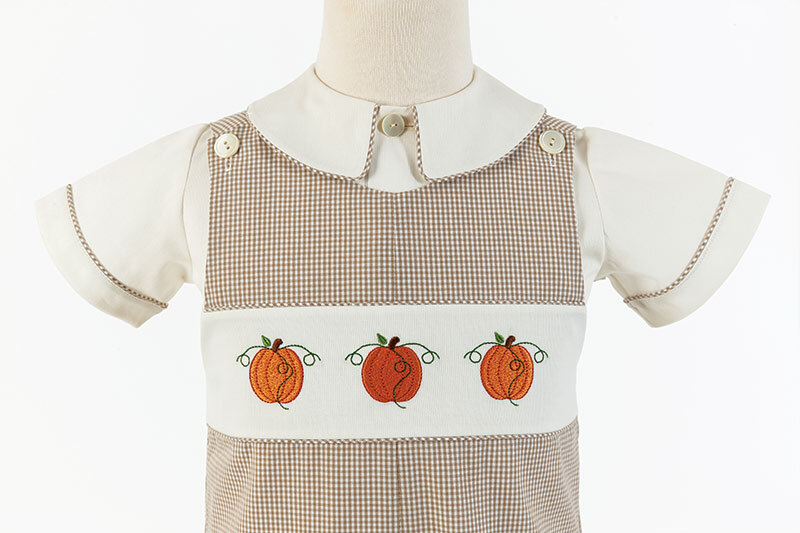 The love of heirloom sewing and smocking quickly took over, and her appliqués were put on the back burner. She did this for 25 years and then started taking care of grandchildren. 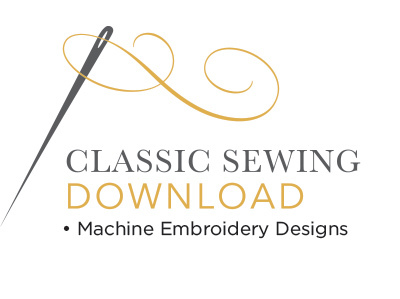 She found herself learning to digitize in the evenings and found a new love in digitizing appliqué. 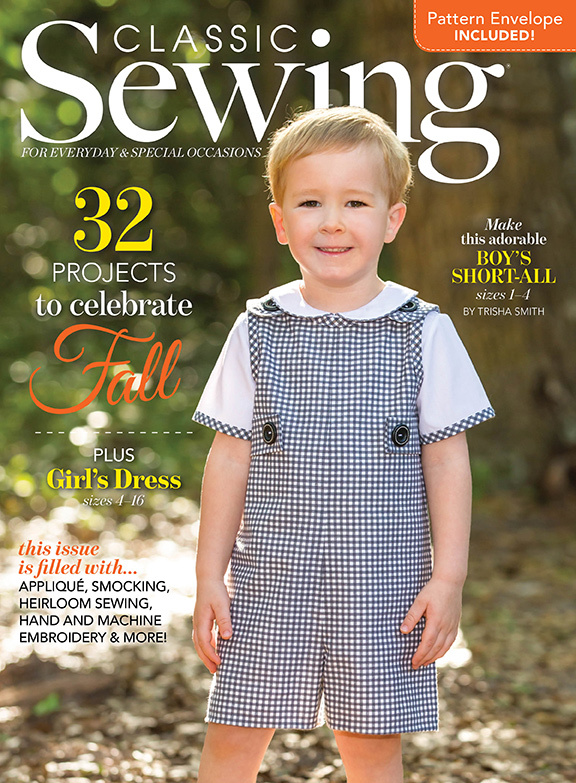 Receive machine embroidery designs for this project with purchase of the Autumn 2018 issue!